This is an early Tango sequence dance from England, choreographed by H. A. Clifton in 1922. The dance is composed of eight parts of 2 bars (4 slow counts) each, for a total of 16 bars (32 slow counts). Part 1: Back the Follow two slow steps along LOD, then back the Lead two slow steps along LOD. Part 2: Chassé (side-close-side, QQS) forward to the left, then chassé forward to the right. Part 3: Two slow steps and a chassé to the center of the room, then turn in towards partner to face outside wall. Part 4: Two slow steps and a chassé toward outside wall, turning to face LOD at the end. Part 5: Promenade two slow steps, and then do a slow 360° pivot in two steps. Part 6: Promenade two slow steps along LOD, point outside foot forward, and then step on it, turning in toward partner to face against LOD. Part 7: Promenade two slow steps against LOD, point outside foot forward, and then step on it, turning in toward partner to face LOD. Part 8: A full turn of slow turning two-step. Repeat from the the beginning. 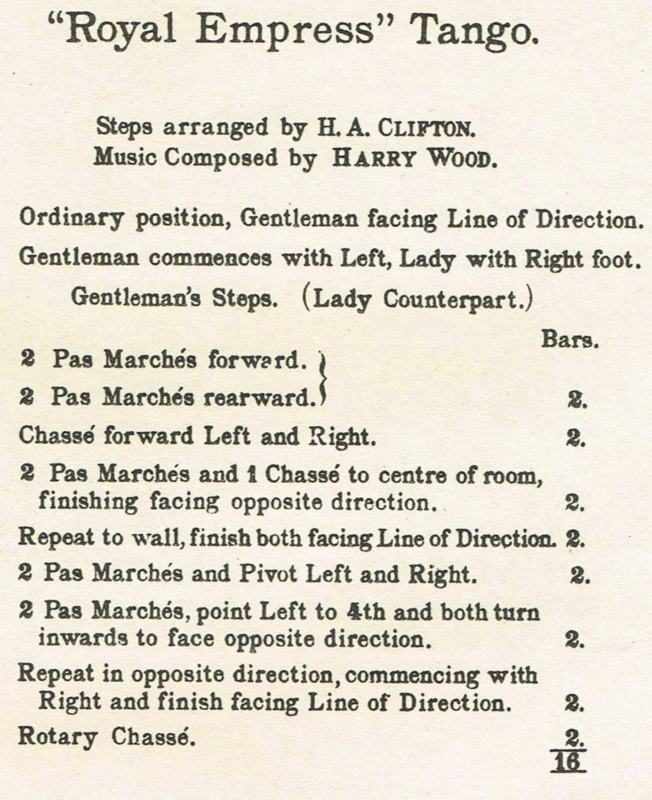 "Royal Empress Tango" by Harry Wood is the original song that accompanied the dance. But you can also use any square (32 count) tango tune. H. A. Clifton. (1922). Royal Empress Tango. London. Cecil H. Taylor. (1947). Old Time and Novelty Dances. London.